Earn 135 - 240 points upon purchasing this product. Use 1350 - 2400 points to purchase this product! 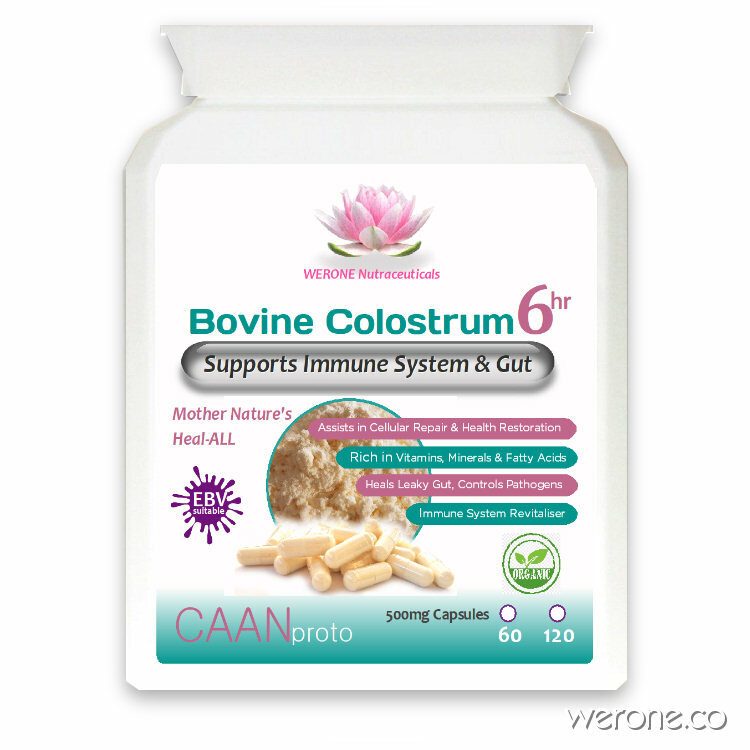 Bovine Colostrum is one of mother natures most potent panaceas. It has been found to contain identical immune factors to humans but is 40x more powerful than human breast milk. Bovine colostrum heals leaky gut faster than almost any other intervention because it was designed to do because calves are born with leaky gut to allow the immune factors to circulate the body quickly and without this also healing the calves would die of infection within 24 hours. This function is exactly why it benefits humans us so much. See here if you are looking for our Bovine Colostrum powder or here for larger packs of the same capsules . It is widely accepted now that many diseases these days have some degree of gut disbiosys, because stress, processed foods, grains, pharmaceutical drugs, chemical toxins and cancer treatments all damage the gut, making healing the gut wall a very central part of a healing modality. Bovine colostrum contains a minimum of 35% immunoglobulins, and is collected within 6 hours of calving from Polish, organic pasture-fed cows. The colostrum undergoes low-temperature processing along with testing to ensure that the different colostrum immunoglobulin fractions retain their biological activity and are not denatured. Colostrum is the most regenerative whole food that nature creates. Loaded with growth factors, the main role is to generate a healthy gut lining in the baby to prevent food allergies and to allow proper nutrient digestion. This enables the baby to fully nourish itself by absorbing nutrients while eliminating food born toxins through the digestive system. Though the original role of the growth factors is digestive health, colostrum contains a whole slew of growth factors that survive digestion to regenerate muscle tissue, bone tissue, nerves (brain), skin and vital organs. The highest quality colostrum supplements should contain 87 different growth factors, each responsible for generating a certain tissue of the mammalian body. If these effects of colostrum sound profound, well they are. In fact if a calf does not get colostrum from its mother at birth, it will die of immune deficiency. So bovine colostrum performs this magic when fed to baby cows, but what about adult humans? Adult humans with there powerful digestive systems, in theory, should simply digest and break down the immune and growth factors with digestive enzymes and render them useless. Leaky gut syndrome is directly associated with many autoimmune diseases, including allergies, alopecia areata, Alzheimer’s disease, autism, chronic fatigue syndrome, Crohn’s disease, depression, diabetes, fibromyalgia, food allergies and sensitivities, heart disease, HIV/AIDS, irritable bowel syndrome, inflammatory bowel disease, multiple sclerosis, polymyalgia rheumatica, Raynaud’s disease, rheumatoid arthritis, scleroderma, Sjögren’s syndrome, ulcerative colitis, and vasculitis. (17-27) The connection between leaky gut syndrome and these autoimmune conditions is the antibodies created by the body in response to the toxic substances and undigested fats and proteins that leak into the bloodstream and attach themselves to various tissues throughout the body, create an allergic response, trigger the destruction of tissues and organs, and create inflammation. As toxicity increases, auto-antibodies are created, and the destruction and inflammation become chronic. There is a tipping point at which the body cannot recover from chronic inflammation, and pathological (disease) diagnosis follows. In studies though, the immunoglobulins and growth factors survive even adult human digestion. Why? Well bovine colostrum contains trypsin inhibitors, which temporarily shut down the enzyme that would break down the immune and growth factors, allowing adults to fully reap the immune and regenerative benefits. This is part of what makes colostrum the most intelligent food on Earth. Aside from its immune transferring and tissue regenerating effects, colostrum is also an unparalleled nutritive. Colostrum contains every essential amino acid, every essential fatty acid and finally every essential glyconutrient (carbohydrate). If you did not know, there are many different essential sugars that, in trace amounts, optimise immune system function. This makes colostrum the one food that you would choose to bring with you to a deserted island. related counterpart insulin-like growth factor-2 (IGF-2), are potent hormones that are found in association with almost all cells in the body. IGF-1 is the best described and most potent of this pair. These molecules are produced by all mammals and, in every case, have a very similar chemical structure regardless of the species. Additionally a protein found in bovine colostrum, lactoferrin, has been shown to have significant antiviral properties. The nuclear localisation of lactoferrin in different epithelial human cells suggests that lactoferrin exerts its antiviral effect not only in the early phase of surface interaction virus-cell, but also intracellularly. The capability of lactoferrin to exert a potent antiviral activity, through its binding to host cells and/or viral particles, and its nuclear localization strengthens the idea that lactoferrin is an important brick in the mucosal wall, effective against viral attacks and it could be usefully applied as novel strategy for treatment of viral infections. Bovine Colostrum is from cows raised without the use of hormone rBGH, antibiotics or pesticides in their feed. Colostrum, aka “pre-milk”, is produced by all mammals (including humans) during late pregnancy for their newborn to drink in the first few days of life, just before the breast milk comes in. The purpose of colostrum is to act as a form of passive immunity and provide a hefty dose of anti-bodies, such as IgA, IgG and IgM, which help to build the newborn’s immunity. It also contains antimicrobials and several growth factors. When a newborn calf comes into this world, they have holes in their gut to allow for the colostrum and the large proteins (anti-bodies) to easily pass through the intestinal wall and enter the blood stream to make it’s way around the body. Growth factors (such as epithelial and epidermal) stimulate the gut to develop and essentially patch up the holes within the first 2-3 days of birth. Really think about how incredible that process is. Then consider what a colostrum supplement could do for your damaged gut. There have been concerns that Colostrum’s IGF-1 growth factors might increase cancer cell production, however, what is most important is the IGF binding proteins(IGFBP 1 to 6), because these attach to IGF-1 and inhibit it’s action of attaching to the IGF cell receptors. IGFBP’s are also found to increase in dis-eased states making more of them available for binding to newly introduced IGF-1 from Colostrum, thereby nullifying the risk. It is very important to take Colostrum on an empty stomach with lots of water to aid its transit into the upper intestine. Colostrum has no contraindications of any sort and with a 98.9% uptake into the body it is used to its fullest capacity within the body and body systems. Colostrum has a half-life of 8 hours, so for maximum benefit it is important to take it three times a day. Bovine colostrum may also be taken sublingually by holding some powder mixed with saliva behind the lower teeth. Colostrum is “Nature’s Healing Miracle”, according to prominent medical doctor Donald Henderson. Medical Research shows that Colostrum is possibly the one supplement that can help everyone that’s ill. And, it’s the most important preventative supplement you’ll ever find.